Lincoln’s funeral procession began in Washington, DC, on April 20, 1865. The train carrying Lincoln’s body stopped in Baltimore, MD, and Harrisburg, PA, before arriving in Philadelphia on April 22. The body lay in state at Independence Hall and was open for public viewing on April 23. The funeral train departed from Philadelphia for New York City at 4:00am on April 24. 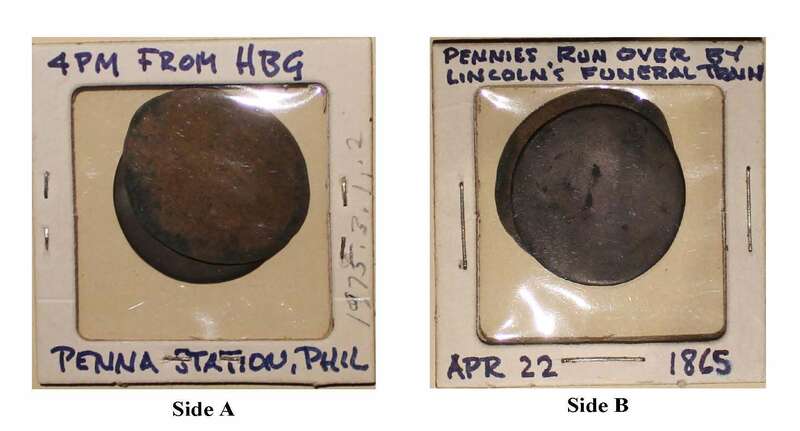 These two coins were placed on the railway tracks between Harrisburg and Philadelphia on April 22nd 1865. The pennies were flattened by the funeral train that departed from Harrisburg at 11:15 am. While in Harrisburg, the President’s body lay in state at the Pennsylvania State Capital building.